My oldest son only has three weeks left of summer vacation. He has been great about working on his workbooks and is more than ready to start second grade. My youngest is ready for his older brother to go back to school so he can have his days back to being just him and I. With only one child at home it is much easier to go places during the day and the pace of my house is more mellow. The only problem is that my oldest is very nervous about starting second grade. He is worried that all of his friends will be in other classes, he won't like his teacher and that the work will be too hard. I felt so bad when he came to me the other day in tears with all of his fears. I know he will be fine after the first day, he just needs to get through the next 3 weeks. In the meantime I have been baking foods that he likes. Yesterday I tried a new recipe for Fresh Rosemary Muffins from Southern Living magazine. This recipe has 12 ingredients. It takes 35 minutes of total time, 15 minutes of which is active and makes 12 muffins. I did make a few changes. First I substituted gluten free all-purpose flour for the regular wheat flour. Secondly, I was unable to find currants at my local store so I doubled the amount of raisins. Since I made the muffins gluten free I added 2 eggs instead of 1. I often increase the amount of egg when I convert baking recipes to being gluten free. I ended up with a total of 11 muffins which took just barely 20 minutes to bake. 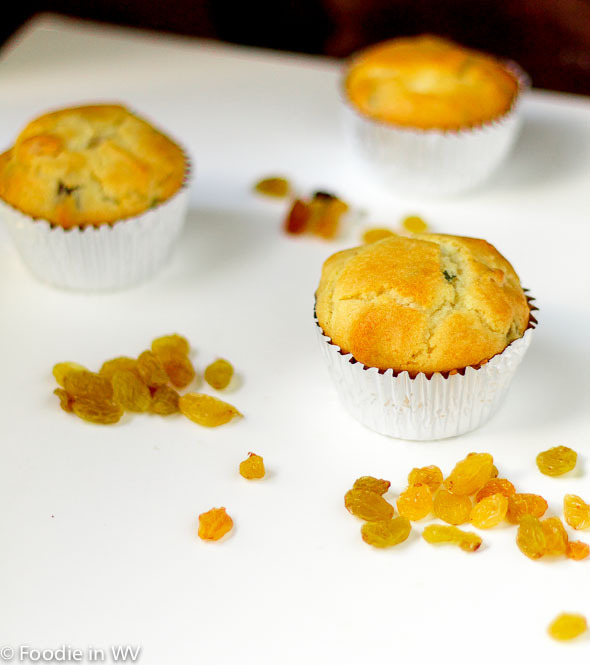 These muffins have a nice sweet taste that blends well with the savory goat cheese. They made a great breakfast with scrambled eggs. My husband thought they were a little sweet for anything other than a dessert or snack, but my kids loved them like I did for breakfast. Overall this was a nice way to use fresh rosemary and worked well being converted to being gluten free. For the recipe go to Fresh Rosemary Muffins. That's crazy that you guys go back so early down there. We don't go back until after Labor Day. We are going back earlier than normal this year. Last year school didn't start until the 18th of August and the year before it was even later. This year we start the 8th. We did get out of school in May though. Gosh..these muffins look to die for! They are already gone, they were great as a breakfast! I think I'm always been afraid of goat cheese and anything goat related, but if you say these are good and your kids like it, then they must be! Beautiful photography as usual Ann, makes me want to lick the screen! Awe, poor kid! Tell him to focus on all the great things about starting second grade, like seeing his friends again and playing during recess! Gym is always a lot of fun too! Best of luck, I'm sure he will be fine once he gets through the first week! Aww I'm sorry your little guy is so nervous. Growing up our new teacher would be written in our final report card, so when everyone got it we'd all be on the phone calling our friends to see if we were in the same class. We always knew those things weeks before school started. Only 3 more weeks? That's crazy! Michigan schools don't start until after Labor Day. We don't even have class assignments and school starts in 3 weeks. They always seem to wait until the last minute here :) We get out in the middle of May, plus we had to make up snow days so that's why we start so early here! I am horrible about doing the same thing :) He will be fine once he starts, he just gets nervous about change. I think we can all be like that at times. I agree about the smell of rosemary, I love it! They do have a lot of raisins in them :) I agree, they are definitely easy and quick to make, which is nice! I wish I could have gluten, but genetics has other ideas :) I modify most of my recipes to be gluten free, except the ones that I won't be eating. The rest of my family can eat gluten with no problems. I tried these muffins, too! I did half the sugar and they were plenty sweet. I didn't have currants on hand either, so used craisins. They were so good hot out of the oven! Great minds think alike :) My husband would have liked the sugar cut in half like you did. He likes his muffins more on the savory side. Craisins were a good substitute for the currants. The grocery store that I shop at used to stock currants, but I think I was the only one that ever bought them so now they stopped stocking them :) I agree that they were best right out of the oven! Awww, your son crying over going to 2nd grade is heart wrenching! I guess he just has to face his fears and I know it won't be nearly as bad as he thinks. It's tough growing up! He will be fine once he starts, he's just a worrier like I am :) I have a ton of rosemary in my garden too, it is so easy to grow which I love! Wow - that is an eraly start to to school year! I sure don't miss it though even if I can't rememeber that far back! The muffins with extra raisins sound good to me. I am so jealous that you have wild rosemary bushes. They smell wonderful and rosemary is great in so many recipes!